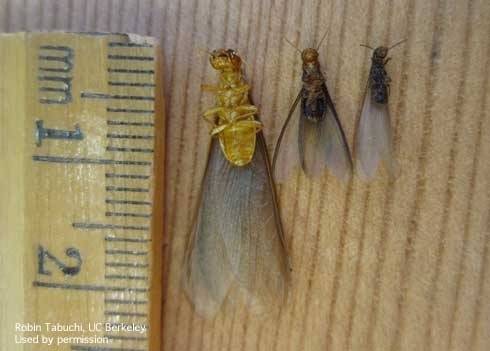 Subterranean termites are the most common in California. They can be found infesting wood that is in contact with the soil, including structural lumber in homes and landscapes, as well as fallen trees, tree stumps, or other dead wood. If you come across groups of insects on the ground that appear to be winged termites, they may actually be winged reproductive ants. Check the Termites Quick Tip card to see the distinguishing features of ants and termites. Termites play a very important role in California forests, woodlands and deserts. Termites help break down woody organic matter which helps return nutrients to the soil. And contrary to popular belief, termites rarely injure or kill trees. If you suspect you might have a termite infestation in your home, contact a professional. Do-it-yourself sprays are not recommended and are not effective. To learn more about termites, read the Subterranean and Other Termites Pest Note and the Drywood Termites Pest Note on the UC IPM web site.